I really do love vegetables–all the vegetables. I appreciate each variety we grow and what makes each one unique. But sometimes, I really do just love to mix them all together! 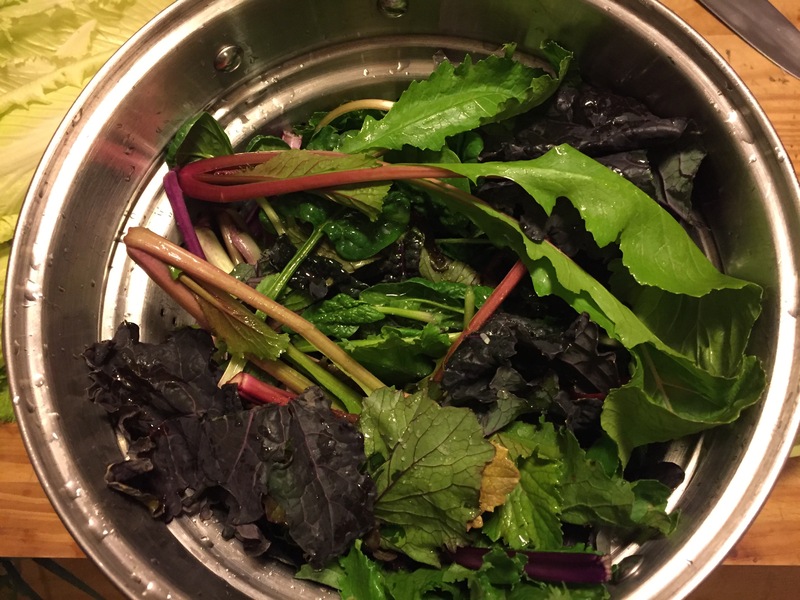 When I want a huge bowl of steaming and flavorful greens, or have a lot to use up, this is how I prepare them. Steam the greens: Use a steamer basket set up, a pot fitted with a colander, or just a big pot. Add an inch or so of water to the pot, and place the greens inside, using a steamer basket if you have one. Bring to a boil and steam for 1-3 minutes, until the greens are just wilted. Remove lid and remove greens from pot promptly. Chop the greens: Let greens cool until you can handle them. Drain them from excess water, and chop well. Saute in garlic: Heat oil in a heavy bottomed pan over low-medium heat. Add garlic cook for about 1 minute, stirring to prevent toasting. Add greens and mix well.Put lid on and cook for 1-2 minutes, until greens are glossy, but still bright. Season with salt to taste. Serve immediately.